Shiny Fuzzy Muddy celebrates its 17th year of operation, every year inviting new guest artists to exhibit and sell their work as part of the curated collection of talent. 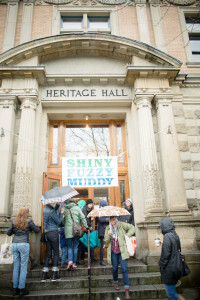 With new, innovative, and Canadian-made products, Shiny Fuzzy Muddy patrons can expect a number of different materials from its 30+ vendors this year. Keep checking back for New Vendor updates! Please contact us (shinyfuzzymuddy@gmail.com) for media access to images. Shiny: Precious objects of adornment. Fuzzy: Warm garments to wrap your home and body in. Muddy: Clay molded into contemporary forms for the kitchen and tabletop. Created as an antidote to large-scale craft fairs and an alternative to big-box-store, mass-produced goods, the thoughtfully conceived Shiny Fuzzy Muddy Show aims to support and promote the brightest creative talents where art, craft, and design intersect. The collective’s mission is to create a space for artists to meet their audiences and where the atmosphere is designed to present work in a context that supports the values and intentions with which it was made. Approximately 25 vendors are invited to exhibit and sell their work at the annual event, held at the historic Heritage Hall in Vancouver. The common thread that ties the work together is the high quality of design and innovation, craftsmanship, and material sensibility. Carefully and thoughtfully curated each season, SFM is known as one of the season’s best shows by both patrons and the participating artists. With a decided lack of holiday music and kitschy decorations, patrons can be sure to find meaningful objects, great conversation, inspiration and to meet the designer/makers directly. The Shiny Fuzzy Muddy Collective formed in 2003 to collaborate in bringing their art to the people. The driving force behind this artist-run, annual event comes from the groups three curators Frances Dickinson, Kari Woo, and Janna Hurtzig. Initially drawn to each others aesthetic sensibilities, they found great support and inspiration in their collaboration and so more than a decade and a half later, the event happily lives on. For additional photos or information, or interviews with vendors or founders, please contact Fawn Mulcahy thefawnz@telus.net.